You'll be £19.99 closer to your next £10.00 credit when you purchase A Soldier of the Seventy-First. What's this? This remarkable memoir was first published in Edinburgh in 1819 and has withstood the test of time. One cannot improve on Sir Charles Oman's description of the book as: 'the work of a man of superior education, who had enlisted in a moment of pique and humiliation to avoid facing at home the consequences of his own conceit and folly. The author wrote from the ranks, yet was so different in education and mental equipment from his comrades that he does not take their vies and habits for granted'. The reader receives the narrative of an intelligent observer, describing the behaviour of his regiment as it travelled the globe. His account covers Whitelock's disastrous South American adventure in 1806, the Peninsular War, the Walcheren Expedition and the Battle of Waterloo. 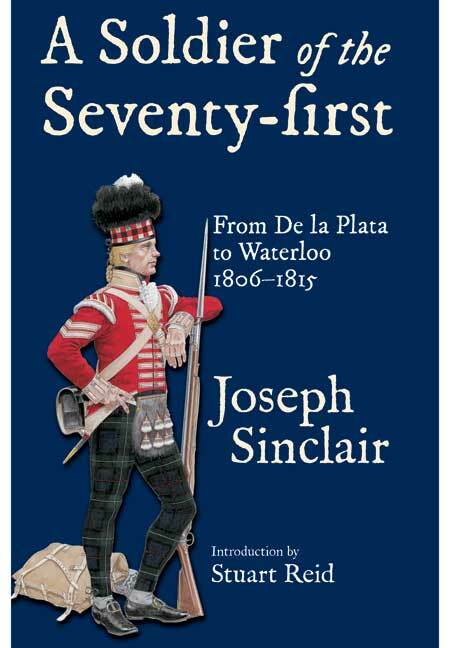 For the first time, Joseph Sinclair has been unmasked as the author of the memoir, thanks to new research work by Stuart Reid. of Fusiliers. His previous work includes Wellington's Highland Warriors (Frontline Books). He is currently working on a full-length military history of the last Anglo-Scots War 1639–1651. You will discover it's the story of an intelligent observer, describing the behaviour of his regiment as it travelled the globe. This edition was edited by Stuart Reid, who has also potentially solved the mystery surrounding the identity of the anonymous author (or rather authors) after some patient detective work comparing his regiment's muster rolls with the events narrated in the text. Joseph Sinclair emerges as the actor and author of the first part of the work, while a James Todd may be the main source for the second part. This is one of the most valuable memoirs to have emerged from the British army during the Napoleonic Wars, providing us with a rare view of events from the point of view of the common soldier.